In a move that makes it the largest single customer of Samsung Electronics this year, Apple is securing future supplies of Sammy's excellent mobile displays, processors, and NAND flash memory, as per Korea Economic Daily. Apple has been locking up large flash memory supplies from Samsung a few times before, in order to secure steady supply and low prices, but this deal tops it all. 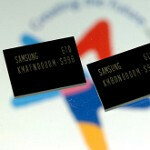 It might also mean higher prices for competitors as Samsung makes a large chunk of the world's flash memory production. It would be interesting to see the deal details, especially in its screen part. We put two and two together the other day that we might see Samsung's new PLS LCS technology in a third generation iPad this fall, and this deal is certainly not doing anything to dispel this speculation. Nothing is mentioned about AMOLED screens, so it might be a safe bet that the next iPhone this year will again have a liquid crystal display. What's more, this also pours more water in the rumor mill about the smaller, cheaper iPhone, which is sure to sell in droves, and require a large components deal upfront. Nothing excites me more than the idea of a 2 inch touchscreen phone....Oh wait, everything excites me more than this. hahahaaa.... this is big news though. Apple is making all the right moves. This leaves Android, WP7, WebOS, BB and others no room for error. I am going to have to disagree with you. If anything, this means that Apple will have nothing that won't be offered on a comparable Samsung Android phone. Therefore, it is actually bad for Apple because they cannot claim they have an edge over the competition. You can't claim to have the fastest processor or the best screen technology when the person you are buying it from also produces their own phones (and if anything they would be giving Apple their "second best" product and saving their best product for themselves). Ever think that Apple might be buying this stuff for laptops and/or just the iPad? I doubt that Apple would drop an AMOLED display into an iPhone; unless Samsung has made an Super AMOLED Plus display with a resolution surpassing Apple's "Retina Display". This is definitely for Apple's ipad and their Macs. And I really don't believe that Apple would be releasing a smaller iphone.